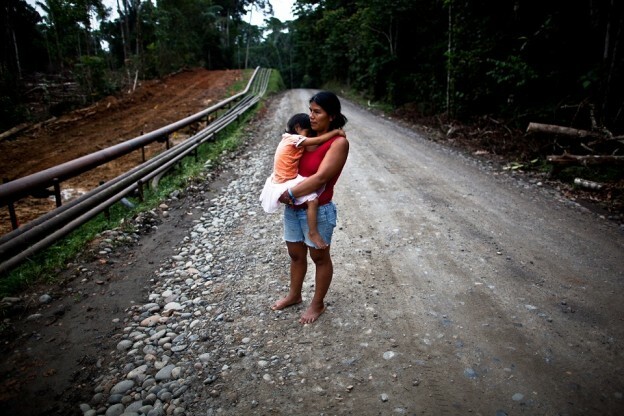 Road networks in the Amazon rainforest resemble fishbones – copious roads destroy indigenous life. With a thunderous boom and the weight of two hundred years, a mighty ceiba tree crashes into the damp earth in which its roots previously lay safely buried. With the absence of this giant, sunlight penetrates the canopy, streaming down to the undergrowth that never before knew the heat of direct sun. The frantic buzzing of chainsaws accompanies the woody creak and thud of more downed trees in this violent industrial symphony in the rainforest. As men in hard hats and denim jumpsuits fell tree after tree, tractors plow through the soil, uplifting bush and root. Steamrollers flatten the earth with a hollow, tinny roar. And thus, another road is gouged out of dense, primary forest in the Amazon. With the discovery of black gold in the Ecuadorian Amazon, oil companies began building roads through the rainforest to connect oil wells with the outside world and lay pipelines to extract the crude being pumped from under the forest floor. Soon the region had become a maze of interconnected roadways stretching through the forest. More oil roads are built every year. As previously unreachable areas of forest open up, colonist settlers move in, taking advantage of road access to start farms and form new communities. As settlers arrive, large areas are deforested and more roads are built. This is referred to as the “fishbone” effect: small “bones” or secondary roads are built off of the “spine” of the fishbone, the original oil road. From the air these road networks resemble fish skeletons. Roads not only allow the oil companies to move ever-deeper into the forest, they also open up the forest to increased logging, farming, and hunting. As roads are built, forests and wildlife disappear. 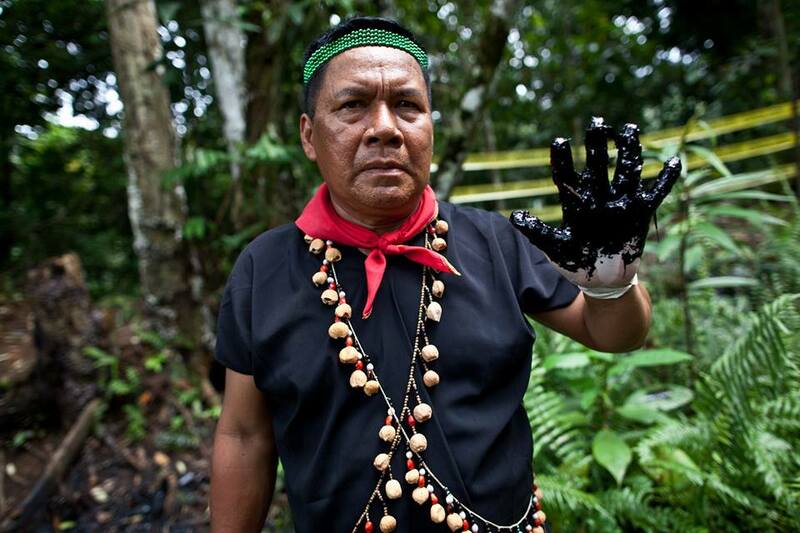 The construction of oil roads alters indigenous way of life in the Amazon. Noise from construction and transit scares away game animals. Hunters come from outside the territories, leading to overhunting and game scarcity. Colonist settlers begin to move into indigenous territories, causing deforestation and the reduction of ancestral lands. With roads come outside influences, like alcohol, often resulting in a cycle of indigenous dependence on money earning activities like logging or working for the oil companies. Thanks to Rainforest Fund partner, ClearWater, www.giveclearwater.org, for the great post and image! Want to blog with us? 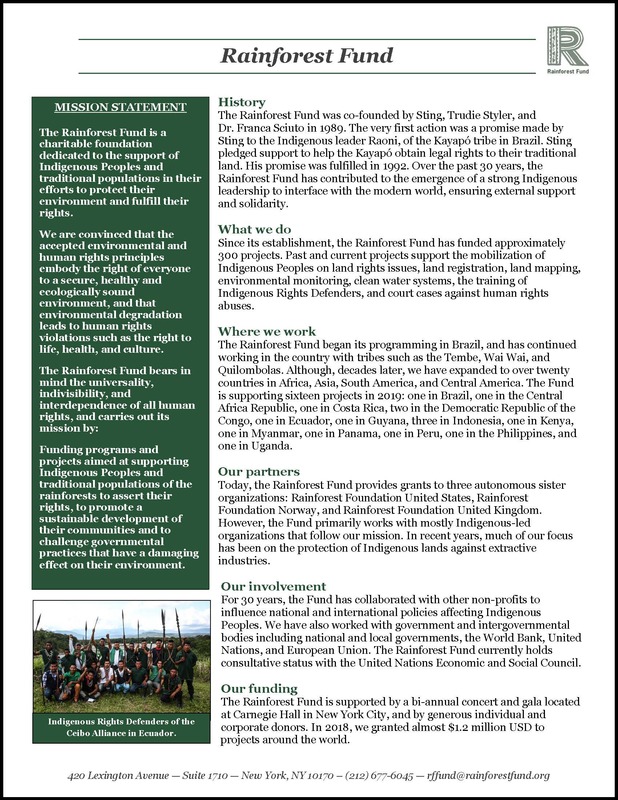 Contact Jennifer at rffund@rainforestfund.org for more information!